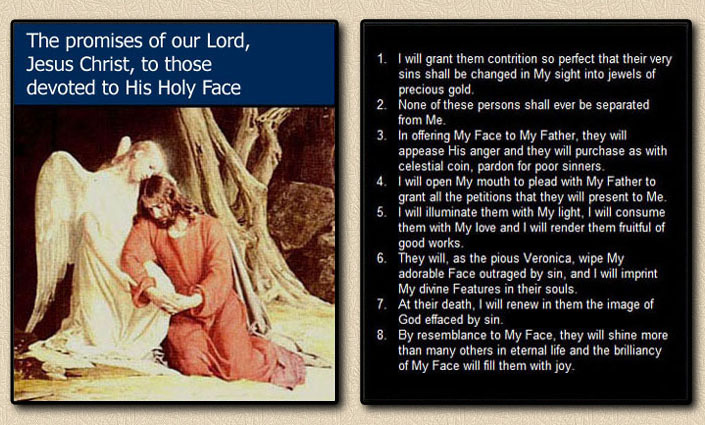 The Most Holy Face of Jesus - what a tremendous gift given to us by our Heavenly Father! Happy are those who hear His message. Happier and more blessed indeed are those who act upon it! Our Lord said, "When I return, will there be faith on Earth?" We have been given an awesome opportunity by our Heavenly Father, the Devotion to the Most Holy Face of Jesus, His Beloved Son with whom He was so well pleased. These are the days of Divine Love and Divine Mercy. 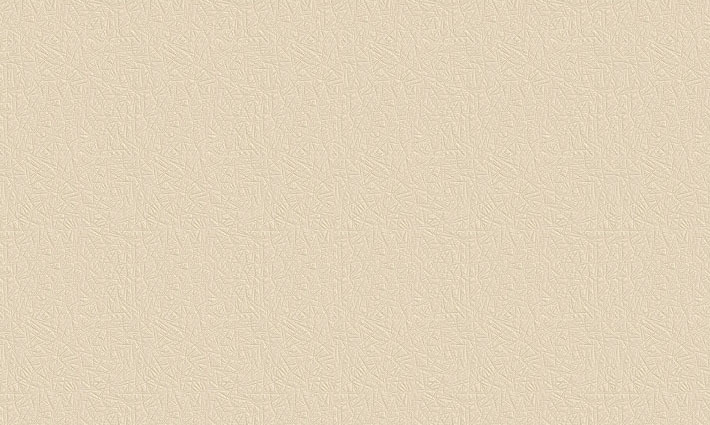 We have been given a remedy for these days in which there is such a great lack of faith. We have been shown through a holy nun, Blessed Maria Pierina de Micheli, how we can receive this great gift of faith and fortitude as well as other important graces. This message is for simple souls: "Unless you become like a little child, you cannot enter into the Kingdom of Heaven." 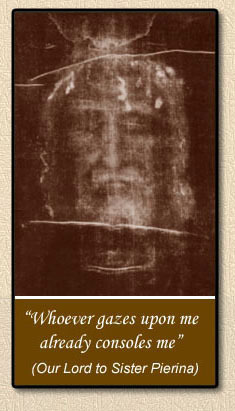 To promote this devotion, the Holy Face Association was established in Montreal, Canada on May 26, 1976. The goal of this apostolate is reparation to God (Father, Son and Holy Spirit) through contemplative devotion to the Holy Face of Jesus. This is accomplished through the diffusion of Holy Face pictures, leaflets and medals throughout the world. The apostolate recalls the words of St. Paul "that Christ crucified must be preached." We belong to The Holy Roman Catholic Church and are in total obedience to the Pope. This Association has been consecrated a great many times to Jesus, Mary and Joseph, for it is their association. The inestimable promises above are drawn from the works of St. Gertrude, St. Mechtilde and from the writings of Sister Maria de Saint-Pierre, a Carmelite who died at Tours, France in the odor of sanctity. If you enjoy listening to the beautiful music playing in the background, you can purchase your very own copy of the CD, "Gregorian Chants: The Best of the Benedictine Monks of St. Michael's" by clicking here or on the image at the right.